Objectives. The epizootiology of White Nose Syndrome (WNS) in bats is best described as partially understood. Indeed, there are uncertainties and questions about the pathogenesis of the disease although it is understood that the fungi Geomyces sp. play a significant role in the onset and progression of the disease. The purpose of this workshop was to develop modeling directions to help assist in the understanding of the temporal and spatial scales, the pathology, and the physiology of bats during WNS stress and ultimately to lead to managed control of the disease. Summary Report. 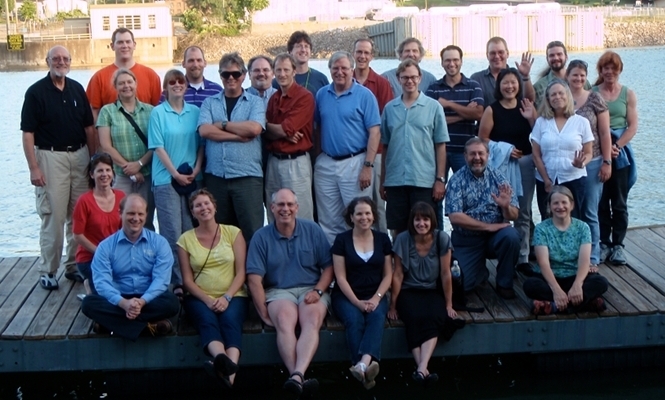 The NIMBioS Investigative Workshop on White Nose Syndrome in Bats (WNS) was held on June 30 – July 2, 2009 with 37 participants from all over the United States. The participants included a diverse array of academicians (primarily theoreticians and biologists), wildlife managers from NGOs, and state and federal government representatives. The focus of the workshop was to understand and mitigate WNS, which is now recognized as the major threat to bats in North America. The workshop was preceded by a webinar held on June 25 featuring 12 speakers who provided background materials necessary for the workshop. The workshop itself consisted of breakout discussion groups that focused on specialized topics and themes, and plenary discussions that focused on results and mitigation needs. Breakout discussion sessions included modeling and fungi, modeling and bat ecology relevant to WNS, modeling perspectives and utility to WNS, and modeling and management. Preliminary work has indicated that the pathogen is an exotic fungus, Geomyces destructans; that the epizootic emanated from a point source in a cave near Albany NY; and that the transmission of WNS is primarily bat-to-bat. The disease is at a critical stage in that it has spread rapidly and has disastrous effects on many species of bats. A primary concern for managers is the ability to scientifically predict when and where the fungus will next occur, which at present is a "best guess." Management has a strong need for models that can aid in decisions about mitigation of WNS. Identification of onset time of infectivity of the bats in hibernacula is of special concern for remediation actions. Properly formulated models can help organize the material, provide directions for experimental work, provide a synthesis of the data, and project testable conclusions about WNS on several temporal and spatial scales. Modeling should be pursued as important components of the WNS analysis and management. WNS Plans for the Future. Immediate time scale plans include organizing groups of workshop participants to meet a July 31, 2009 deadline for proposals for a special U.S. Fish and Wildlife Service funding initiative on WNS. At this stage no modeling groups have actively pursued funding for WNS research, but with impetus from this workshop, at least one modeling proposal will address this RFP. Another group that has emerged from the workshop is exploring chemical and veterinary intervention to the spread of the disease. Plans were presented to convene a small group of modelers and biologists to organize the modeling efforts for WNS, hopefully through the auspices of NIMBioS. In August, we plan to present a proposal to NIMBioS that will form a working group on WNS. This group will be a select but diverse group including several participants from the workshop. Benson B. 2010. Dissertation: White nose syndrome and migration of Delaware's bats. Delaware State University. Pannkuk EL. 2010. Dissertation: Fungal metabolism of chiropteran integument and biomechanical damage by geomyces species. Martinez AT et al. 16-18 April 2014. Network for integrating bioinformatics into life sciences education agenda, Omaha, Nebraska. Souza MJ, Reeder D, Hines B, Dutkosky R, Ramsay E, Cairns T, Newkirk K, Cox S. 2013 September 3-6. 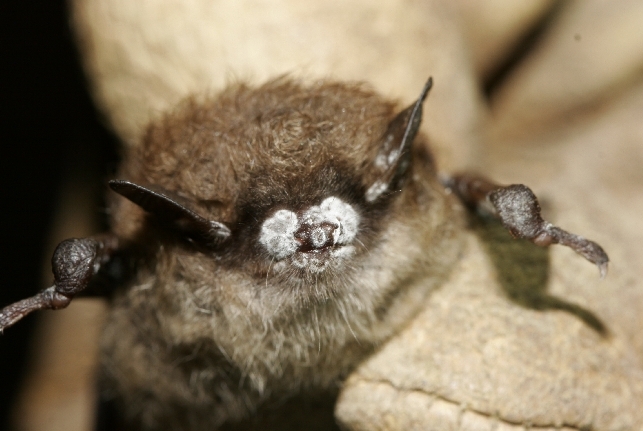 Investigation of a terbinafine impregnated subcutaneous implant for the prevention or treatment of white nose syndrome in little brown bats (Myotis lucifugus). White Syndrome Symposium, Boise, ID. Souza MJ, Yarbrough JW, Cox SK. June 2012. In vitro investigation of a terbinafine impregnated subcutaneous implant. White nose syndrome symposium, Little Rock, AR. Ingersoll T. February 2011. Zero-inflated count models for imperfectly observed invasions: Implications for white-nose syndrome surveillance. 21st Colloquium on the Conservation of Mammals in the Southeast United States, Louisville, KY.
Ingersoll TE. October 2010. Accounting for seasonal effects with additive mixed models for counts of bat activity. North American Society for Bat Research, Denver, CO.
Kunz TH, Frick WF, Pollock J, Reynolds RS. February 2010. Impact of white-nose syndrome on ecosystem services provided by insectivorous bats. 2nd Berlin Bat Meeting: Bat Biology and Infectious Diseases, Berlin, Germany. Kunz TH, Blehert DS, Cryan PM, Coleman JH, Hicks A, Tuttle MD. 2009. White-nose syndrome in hibernating bats: Are these affected bats the next "canary in the mine"? 15th International Congress of Speleology, Kerrville, TX. Pannkuk EL, Risch T, Savary B, Gilmore D, Huss M. 2009. Proposal: Fungal digestion of chiropteran integument. National Speleological Society. $5,800. Accepted. Wallrichs, M. 2010. Golf Course Habitat Improvement for Bat Conservation (DE/MD) (includes monitoring for WNS). Delaware State University, Dover, DE.